Namewaminikan Hydro (NH) is proposing to develop the Namewaminikan Waterpower Project (NWP), which consists of two “run-of-river” hydroelectric generating stations on the Namewaminikan River. This river is essentially located in the municipality of Greenstone and runs north of the community of Beardmore, Ontario. 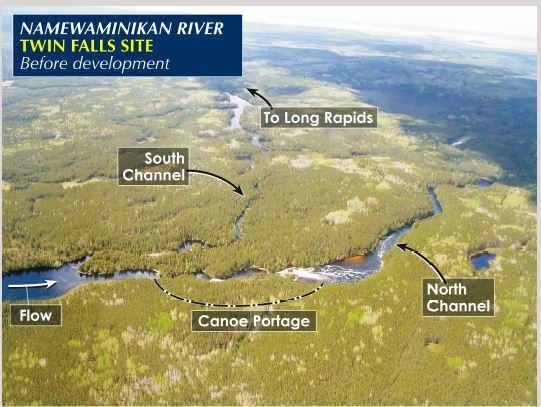 The sites to be developed are called Long Rapids and Twin Falls. The Long Rapids station will generate 5.6 megawatts (MW) of hydroelectric power whereas the Twin Falls station will produce 4.4 MW, for a project total of 10 MW. The project will require the construction of a new 34.5 kV powerline. 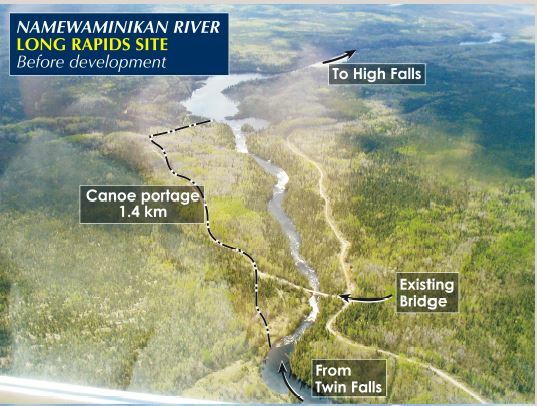 This line will bebuilt along existing roads and along the High Falls powerline over a distance of approximately 22 km. A Feed-In-Tariff (FIT) contract for 40 years of electricity purchase was signed with the OPA in April 2010. The construction schedule was produced taking into consideration restrictions related to clearing, instream works and moose calving activities. Construction is planned for summer 2012, whereas commercial operation is scheduled for fall 2014. More information here. A Permit to Take Water has been applied for and is open for comment under an EBR 012-1976 until 19 July 2014.